Here are resources to help you learn what you need in order to teach transition concepts in your postsecondary program. 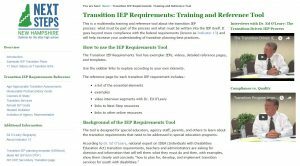 The Transition IEP Requirements: Training and Reference Tool is a multimedia training and reference tool about the transition IEP process. It covers what must be part of the process and what must be written into the IEP itself. Work through the pages to learn or remind yourself about Indicator 13 requirements and best practices. Individuals with Disabilities Education Act (IDEA) ensures students with a disability are provided with Free Appropriate Public Education (FAPE) that is tailored to their individual needs. Indicator 13 explanation and NH resources. Indicator 14 one page overview. Every Student Succeeds Act (ESSA) reauthorized the 50-year-old Elementary and Secondary Education Act (ESEA), the nation’s national education law. Section 504 of the Rehabilitation Act of 1973 is a civil rights law that prohibits discrimination on the basis of disability. The Americans with Disabilities Act (ADA) is a civil rights law that prohibits discrimination against individuals with disabilities in all areas of public life, including jobs, schools, transportation, and all public and private places that are open to the general public. Assistive Technology Act (Tech Act) provides federal funds from the U.S. Department of Education to states to develop training and delivery systems for assistive technology devices and services. There are also extensive New Hampshire Rules for the Education of Children with Disabilities (PDF, 133 pages, 2017). These new and revised rules became effective March 24, 2017. Find more on the Transition Law reference page. The Transition Coalition at the University of Kansas provides seven free research-based online training modules for professionals and others involved in transition planning. These modules use up-to-date research and were tested by practitioners across the country. The modules include best practices in transition, working with families, transition assessment, career development, transition for youth with ED/BD, cultural diversity and self-determination. One choice is Collaborating with Families, from the Iris Center at Vanderbilt University. It highlights the diversity of families and addresses the factors that school personnel should understand about working with the families of children with disabilities. The Next Steps NH project developed a set of core competencies to enhance special education teacher candidate knowledge and skills about transition, based on existing standards and frameworks. Review the competencies and the other resources on this page for a better understanding of transition in preservice curricula and inservice professional development. 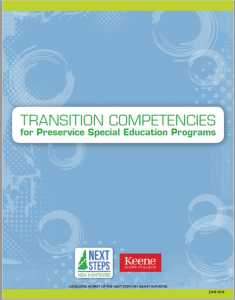 The Transition Competencies for Preservice Special Education Programs were developed in 2014 and revised in 2018 by the Next Steps NH project to enhance special education teacher candidate knowledge and skills about transition. There are six core transition competencies and 31 corresponding key elements. The standards are not required for New Hampshire state certification, but are intended to enhance curriculum efforts by providing a set of important transition skills and knowledge for beginning special educators. The Council for Exceptional Children’s Advanced Special Education Transition Specialist Standards. (2013) were the primary guide for the development of the transition competencies. These standards have been used as guidelines for job descriptions, in college and university educator preparation programs, and as rubrics to access the knowledge and skills of transition specialists and teachers. The transition competencies were framed by the Taxonomy for Transition Programming (Paula D. Kohler, 1996) in order to connect to the larger context of established transition program improvement areas. 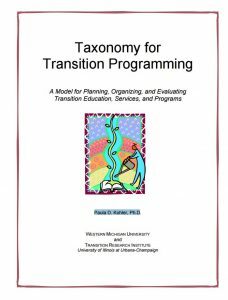 The Taxonomy is a model for planning, organizing, and evaluating transition education, services, and programs. 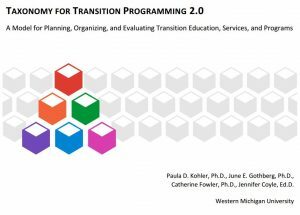 A larger group of authors (Paula D. Kohler, June E. Gothberg, Catherine Fowler, Jennifer Coyle from Western Michigan University) recently released an update, Taxonomy for Transition Programming 2.0 (PDF, 12 pages, 2016). Teacher Preparation to Deliver Evidence-Based Transition Planning and Services to Youth With Disabilities is an article by Mary E. Morningstar, University of Kansas, and Valerie L. Mazzotti, University of Oregon (PDF, 58 pages, July 2014). It describes an innovation configuration matrix that can guide teacher preparation professionals in the development of appropriate transition planning and services content. An innovation configuration is a tool that identifies and describes the major components of a practice or innovation. Implementing Secondary Transition Evidence-Based Practices is a multi-state survey of transition service providers by Valerie L. Mazzotti, University of Oregon and Anthony J. Plotner, University of South Carolina (PDF, 11 pages, 2016). Results showed that providers had limited training, access, and preparation related to evidence-based practices. The Center for Parent Information and Resources (CPIR) houses a large collection of transition information, written in a conversational tone, about different aspects of special education. The National Center for Learning Disabilities improves the lives of people with learning difficulties and disabilities by empowering parents, enabling young adults, transforming schools, and creating policy and advocacy impact. WestEd’s National Center for Systemic Improvement (NCSI) helps states transform their systems to improve outcomes for children and youth with disabilities. NCSI provides technical assistance to support schools in improving educational results and functional outcomes for children and youth with disabilities. Featured are Cross State Learning Collaboratives, networks of shared leadership and peer support among states on topics related to improving outcomes for children with disabilities. Click on the Resources tab, then Learning Collaboratives and scroll down to Graduation and Post-School Outcomes resources. National Collaborative on Workforce and Disability – for Youth specializes in topics related to employment and youth with disabilities. The focus is on empowering youth to participate in planning their future. This is a particularly good resource for students, written in language that is both motivational and age-appropriate. The National Technical Assistance Center on Transition (NTACT) assists State Education Agencies, Local Education Agencies, State VR agencies, and VR service providers in implementing evidence-based and promising practices ensuring students with disabilities, including those with significant disabilities, graduate prepared for success in postsecondary education and employment. NTACT is the successor project to NSTTAC (National Secondary Transition Technical Assistance Center) and their website houses many of the NSTTAC resources. The Parent Information Center on Special Education (PIC on Special Education) is New Hampshire’s Parent Training and Information Center. Since 1975, the PIC has been providing information, training, and support to families who have a child with a disability to help them be effective team members in the special education process. The National Parent Center on Transition and Employment, from Minnesota’s Parent Training and Information Center (PACER), keeps the needs of families at the forefront and helps youth with disabilities find success in postsecondary education, employment, and life in the community. Connecticut: Secondary Transition Resources is the entry point to a host of transition-related resources on the Connecticut State Department of Education site. Maine: Transition information is included in the Special Education part of the State of Maine website. There is more in the Support and Supervision, Laws and Regulations, and Programs links on their sidebar. Massachusetts: Youth on the Move provides transition information, strategies, and resources to teachers, counselors, family members, and community providers. Secondary Transition is the resource page on the Massachusetts Department of Elementary and Secondary Education website. New Hampshire: Secondary Transition page on New Hampshire Department of Education site. Also the official Next Steps NH page. New Jersey: Transition from School to Adult Life is the transition section of the State of New Jersey Department of Education. New York: Transition from School to Post School for Students with Disabilities is the entry point to transition resources on the New York State Department of Education website. NYS also has a Transition Services Professional Development Support Center (PDSC) at Cornell University. Some pages are open; others require you to set up a free account. Rhode Island: Transition Services means… lists transition-related resources on the Rhode Island Department of Education website. Vermont: Transition Toolkit for Youth with Disabilities from the Vermont Family Network. Indiana: Indiana Secondary Transition Resource Center, specifically their Transition Assessment Matrix. Wisconsin: Transition Planning for Students with Disabilities, includes their Transition Action Guide for Post School Planning (PDF, 77 pages, 2015) and Community-Based Transition Options for 18- to 21-year old Students with Disabilities (PDF, 84 pages, 2013). Another Wisconsin site is Transition Resources for Youth (TR4Y) with a searchable library of 400+ transition resources.